Forgot to post this up sooner! 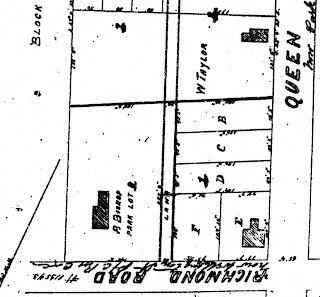 Hintonburg in the 1860s was strictly farmland. There was not yet even a village here. There was no town hall until 1873, there was no post office (1879), no subdivisions of builder lots. In fact, it wasn't even "Hintonburg" yet; that name would come around 1879-1880. 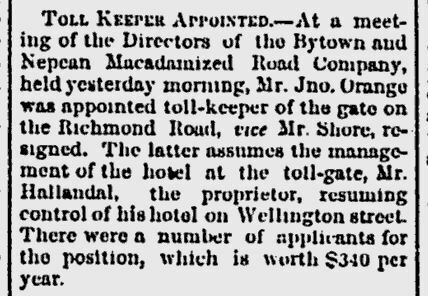 Richmond Road was a toll road, and had been macadamized to Bells Corners in 1853. It was the only road which ran through the patchwork of farms which stretched westward from the slowly expanding centre of Ottawa. There were no stores or shops in the neighbourhood, and only a handful of residents. The only business which existed was a small, crude inn and tavern run by Joseph McGaw on Richmond Road at where Carruthers now begins, which opened in 1864. These were the earliest days of Kitchissippi's growth, and it sure would be interesting to have a time machine and go back to 1865 and take a walk though the area. Almost certainly there would be little that would be recognizable. The 1870s would see Hintonburg develop into a vibrant hamlet and village, led by the efforts of Robert Hinton and his father Joseph. Robert had arrived first in the late 1850s, and Joseph came from Richmond to be close to his son in the late 1860s. The story of the Hintons is best left for a long feature story (some day soon in this blog! ), but these details help paint the picture of how Hintonburg began to develop. 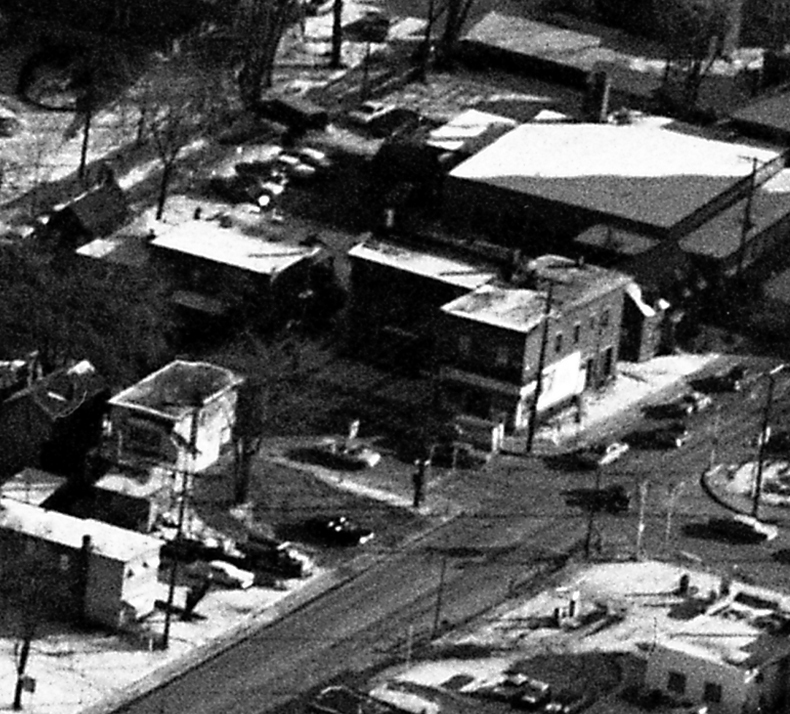 Arguably one of first key events in the establishment of Hintonburg happened in 1866, when a modest-sized inn was built on the south side of Richmond Road (Wellington Street West was still called Richmond Road into the early 1900s), at the corner of what is now Parkdale Avenue, but which was then just a side line road that mostly functioned as a dirt access path to the south to what is now Carling (Carling itself at the time was a toll road) towards Bowesville, Merivale and Manotick. The story of this inn is the subject of this blog post today! 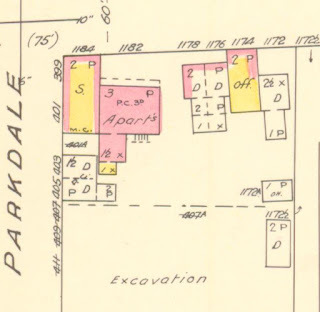 The property to the east of Parkdale Avenue was for a long time the farm of the Anderson family, who arrived in the area not long after the Bayne family (they of the historic Bayne House on Fuller Avenue). 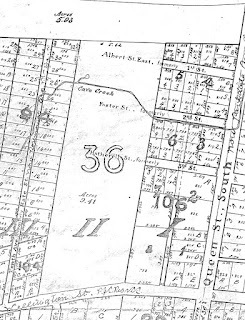 The Andersons acquired the north half of lot 36 in 1831 from cousin James Anderson, who had recently acquired it from the original crown land grantee. The Andersons had come to Canada from Scotland with their six young children sometime in the 1820s, and in 1831 settled on this 100-acre piece of land (from Scott Street to about where the Queensway now runs, between Parkdale and Merton). They established a decent-sized farm, and remained here through much of the mid-19th century. Their old farm house was located on the south side of Wellington, half way between Wellington and Gladstone. It was a log house, which was later clapboarded. It is of course long, long gone, likely demolished in the 1800s. John Anderson passed away in 1849 at age 62, leaving his widow Janet alone on the farm. 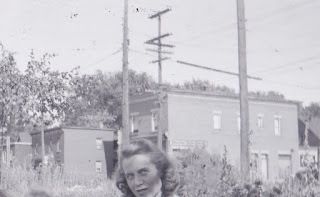 Her daughter Janet and son-in-law James had been living in New York but around this time moved back to Nepean, perhaps to help her Mom with the large property. During the 1850s, she sold off small pieces of the farm to various buyers, before subdividing the remaining property in 1861 into 8 large blocks (curiously each a different size) and willing them to her children later that year when she died. (This was Carleton County Plan 14, one of the earliest subdivisions in the Ottawa area. 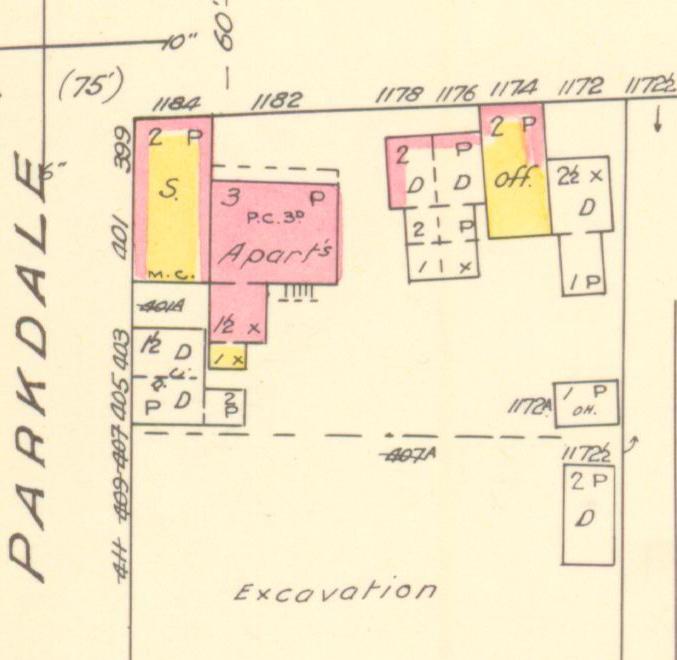 Block 1 comprised the area which is now from Wellington back to Sims Avenue, from Parkdale west to about the center of the Grace Manor (or about half-way to Beverley Avenue at the south end). Block 1 was a total of 7 acres, 3 roods and 22 3/4 perches (in the 19th century, land area was measured using these measurement types). This Block 1 above was gifted to son Thomas Gilmour Anderson (1811-1881). 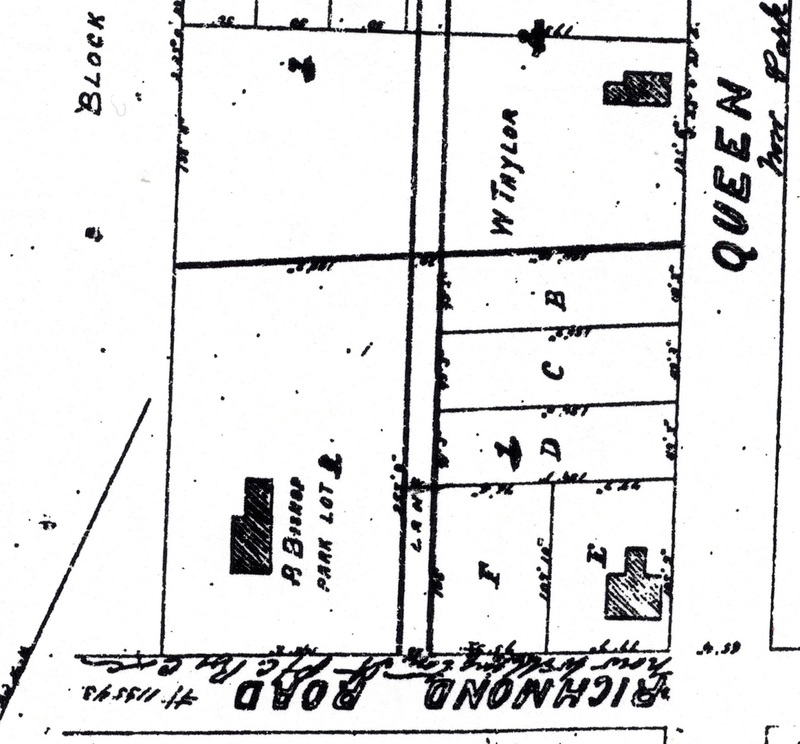 In 1865, Anderson split the block into 8 individual lots, and registered this as Carleton County Plan 21. Later that year, construction began on an inn at the north-west corner of the property fronting Richmond Road (in lot 1 of the aforementioned Plan 21). 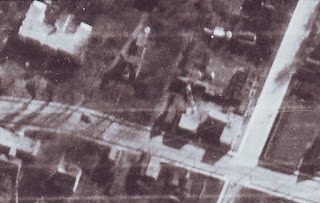 This location was an ideal spot for an inn, as it was located immediately inside the toll booth gates on the Richmond Road (Toll House number 1 of the Bytown and Nepean Road Company was located on the other side of Parkdale, at the southwest corner, in Nepean Township lot 35). With little else built in the area, it was simply a choice spot to build, to provide temporary accommodation for farmers with produce and travellers on their way to Ottawa, who wished to rest for the evening before going in to town in the morning. 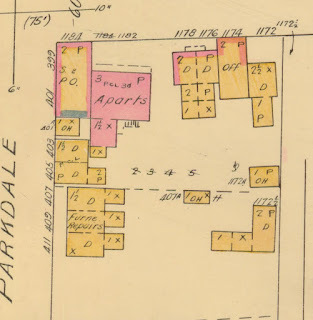 The hotel would have caught 'traffic' from both the west along the macadamized Richmond Road, and from the south for those who travelled the old macadamized road (Carling) and then down the sideline road now known as Parkdale. Hence, the hotel was dubbed the "Farmers' Hotel". Opening in this location was fairly shrewd, as Anderson got the advantage on the McGaw hotel, which was a few blocks to the east on Richmond (McGaw would remain in business though until 1877). Records from the era, perhaps not too surprisingly, are scarce. Putting the pieces together on the details of the construction of this hotel is not easy, and relies heavily on old assessment rollbooks and land registry documents now over 150 years old. Several sources have written about this old hotel, and largely have been inconclusive about its date of construction, or even the builder. Several sources have identified the hotel as being built either by or for William Taylor, who was a prominent Hintonburg resident in the 19th century, tied in to the history of many of the village's earliest and most memorable houses. In the case of this hotel, he indeed is closely associated to its construction - it was he who provided a substantial mortgage of $2,200 to Thomas G. Anderson in February of 1867 after Anderson had taken out two smaller ones in September and November of 1866 (for $1,200 and $400 respectively). Significantly however, just a year later, on February 19, 1868, Anderson transferred ownership of the property to William Taylor. Bruce Elliott wrote that Taylor was a son-in-law to Mrs Janet Anderson, and indeed, Taylor was married to daughter Margaret Anderson. Thus it appears Taylor may not have built it himself, or even for himself, but certainly less than two years after its construction (which he financed), he was its owner, though only briefly. The hotel was certainly open for business by April of 1867 (and probably even a little earlier than that) as evidenced by a line in the 1867 Nepean Township assessment roll, which lists John Anderson, 25-year old son of Thomas G. Anderson, as the hotel keeper on the 6 3/4 acre lot owned by his father (which was one acre less than what Block 1 originally comprised, as Lot 8 had been sold to Ottawa hotel keeper Richard Bishop, who in 1865 had constructed a stone house where the west portion of the Grace Manor now stands). The Farmers' Hotel was both a resting place, and as was common for hotels of the era, and very likely also contained a tavern. By the spring of 1868, Thomas G. Anderson and his family were listed as residing in the hotel, but as tenants to Taylor, who as mentioned above, had acquired it in February (either due to the fact that the Andersons defaulted on their mortgage to Taylor, or perhaps that it had been the arrangement all along for the Andersons to build the hotel for Taylor, though that seems unlikely). 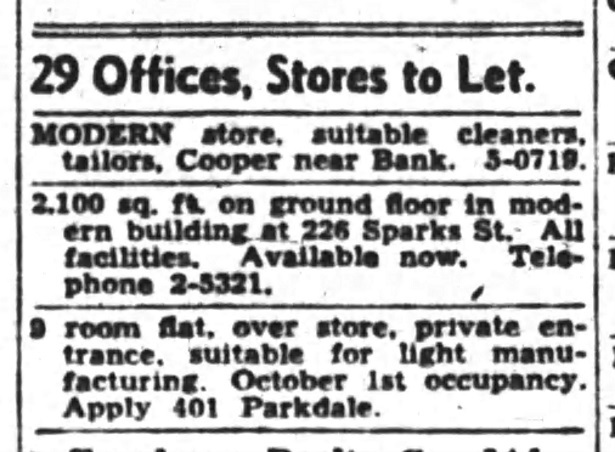 This was the last mention of this branch of the Andersons in Hintonburg (other siblings would sell/remain in Hintonburg on the old family farm at varying lengths of time), as Thomas G. and family would relocate to more rural farmland in Nepean just east of Moodie Drive, north of Fallowfield Road. In April of 1869, William Taylor sold the Farmers' Hotel and its outbuildings to Francis Hallandal, who also was a veteran hotel keeper in Ottawa. Sale price was 500 pounds sterling (equivalent to about $83k of Canadian currency today), and Hallandal paid 150 pounds, with the remaining 350 owed to Taylor as a mortgage (for the purposes of the mortgage, it was remarked that the buildings were insured at the amount of 800 pounds, or $134k today). 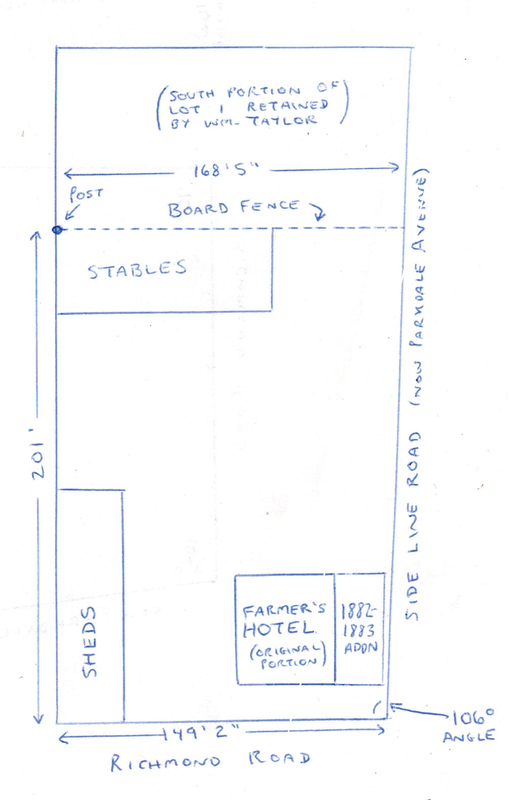 The one assumption I've had to make in all of this is figuring out the footprint of the "original" 1867 hotel. There were many additions put on to it over the years, and as you'll see by some of the photos of the buildings towards the very end of this article, the original structure had become the interior to a larger building which had been modified inside and out repeatedly over its 110+ years of existence. Based on the fact that a significant addition was added to it between 1882-1883, and from looking at the photo from 1980, I deduced that the original 1867 hotel was the easterly part of the building. There are no records or drawings (or of course photos) from before 1883 which can confirm the original footprint, but I'm quite certain this was it. 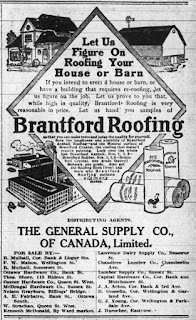 The 1869 purchaser Francis Hallandal (1827-1890), was born in London, England, and had arrived in Ottawa, or possibly Bytown, sometime in the 1850s or early 1860s. This was a classic era of Ottawa history, when Ottawa was just beginning to grow, had just been named the capital city of Canada, and hotels for workers and new arrivals to town were extremely popular. Hallandal opened the Britannia Inn on the north side of Wellington Street between Kent and Lyon (now the grounds of the Supreme Court), a hotel which remained in operation into the 1880s. Details on Hallandal are surprisingly scarce, however he was noted in 1876 as having acquired a talking parrot that was a highlight of his tavern. It is likely the parrot resided in the tavern in Hintonburg when he relocated there in 1878. In most references to the Farmers' Hotel, it is referred to as "Hallandal's hotel" (often misspelled Hallandale). Though he did own the hotel for 17 of the 20 years it operated, Frank only managed it himself for two years in the late 1870s. Hallandal hired a variety of different men to run the Farmers' Hotel. Most were in their 30s, and had their wife and children residing in part of the hotel with them. This list includes: James Mitchell (1869-1870), Charles White (1871-73, and his widow in 1874), T. R. Shea (1875-1876, along with his large family of 9, plus a cow, a horse and 2 pigs); William McElroy (1877), Hallandal himself (1878-1879), Robert Shore (1880-1882, with his family of 10), and James Byers (1883-1886). 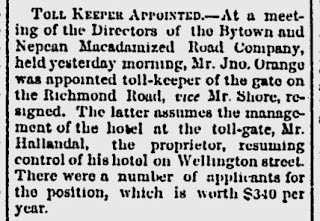 The Ottawa Citizen noted in November of 1879 that toll-keeper Robert Shore had resigned his position to manage Hallandal's hotel, as Hallandal had moved back to his downtown Ottawa hotel. The final manager of the hotel, James Byers, was perhaps its most noteworthy. Byers took over sometime in late 1882 or early 1883, which was when the hotel was apparently expanded (based on the increase in assessed value between 1882, when it jumped from $1,700 to $2,400). Byers is one of the most significant names from early Hintonburg, as in 1886, he would go on to open the "Hintonburg House" hotel on Wellington Street in the heart of Hintonburg, across from the St. Francois D'Assise Church. The hotel, which would later become a boarding house after prohibition was introduced, was well known as a colourful Hintonburg drinking establishment. More on Byers in a future post dedicated to the family. 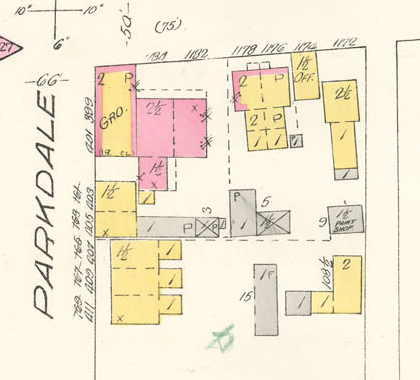 The 1882 or 1883 addition saw an expansion of an additional 50% of building space to the west, right to the curb along Parkdale (then known as Queen Street). This was where the tavern would have been located as of this time. 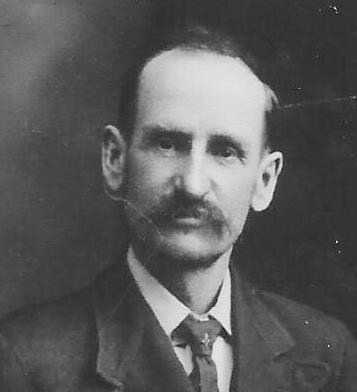 On November 5, 1886, an era came to an end when Hallandal sold the hotel and property to Robert G. Foster. The sale price in 1886 was $2,500 cash, plus assumption of the $4,500 mortgage. Robert Gregory Foster (1859-1941) was 27 years old and the son of John Foster (1833-1908). The Fosters are notable because they had long been farmers in the Fallowfield area of Nepean Township (incidentally very close neighbours to Thomas G. Anderson), and for whatever reason in 1886, decided to invest in the growing hamlet of Hintonburg on the outskirts of Ottawa. 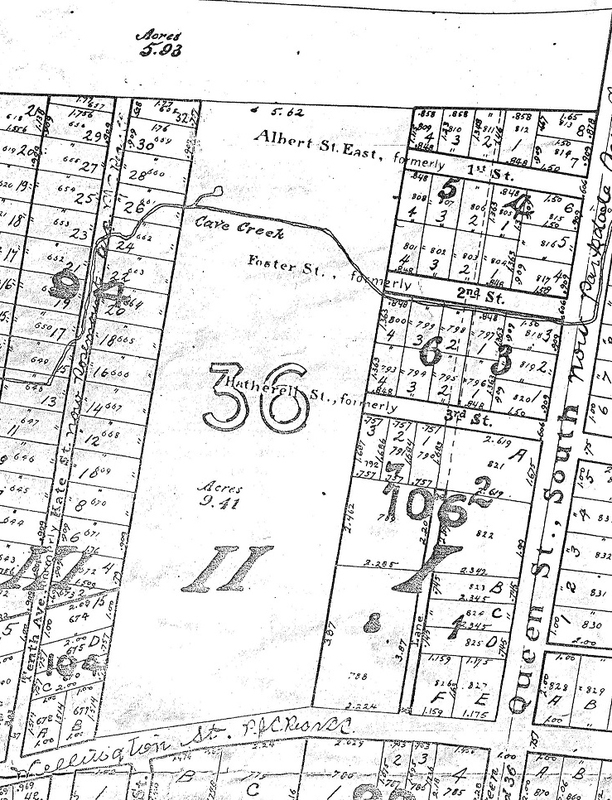 Robert acquired lot 1 in 1886, while his father John bought up lots 3, 4, 5, and, as well as the southern portions of 2 and 7 (so virtually all of original Block 1) in 1888. Robert Foster immediately converted the Farmers' Hotel into a grocery store. With the Hintonburg population booming, there was a need for greater services for the expanding neighbourhood. Foster obviously felt that the hotel was no longer required, particularly as train service, improved road networks, and the growing suburbs of Westboro and Woodroffe were decreasing the need for hotels in the area. 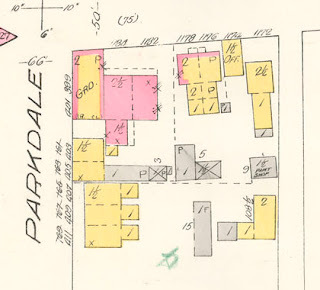 Perhaps even more notably, the toll booth at Parkdale had burned in a fire in 1883, and the Road Company decided to rebuild further east at what is now 1121 Wellington Street West, so the immediate proximity was lost. 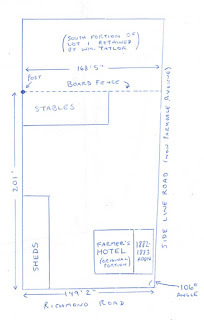 But also in June of 1889, John Foster laid out a plan (Carleton County Plan 106) subdividing their six acres of land into smaller builder lots (the Foster grocery store was located on new Lot E). The plan also created new streets running east off of Queen Street (Parkdale) called 3rd Street (now Gladstone), 2nd Street (now Foster Street) and 1st Street (now Sims Avenue). These lots more or less still all exist today as the property boundaries for this part of the neighbourhood. Obviously, Foster Street was later named for the Foster family's early contributions to the community. The strategy of laying out a subdivision would help ensure that the land could be sold more easily, at $100-$200 per lot. A bonus result would be that the larger the population around the store, the busier business at the shop would be. Perhaps that is why later in 1889, Robert Foster's younger brother, 23-year old Francis Albert Foster, took over operations of the store and later in 1891 purchased it altogether. Block 1. The Farmers' Hotel is at bottom right in lot E.
On May 12, 1889 the first Sunday School class in Hintonburg, that of the Bethany Presbyterian Church (which later formed part of the Parkdale United Church) was held in the room above the grocery store, referred to in a 1914 article as "Foster's Hall". These early classes ran every Sunday for a year until the completion of the first Presbyterian hall and school in 1890 (across the street on the southwest corner). On the 1891 Census, Francis Foster was listed as living alone in his brick, 2 storey, 10 room house. He was listed as a Merchant, with his store described as being "Grocer & Feed". He married Mary Ann Garland later in 1891, and in October of 1892, they had their first of three children. By early 1893 he must have decided the grocery store life was not for him, and he and his family moved back to the Foster's Fallowfield area farm. They had two more children soon after, before Francis tragically died after a year-long illness at the age of 29, in 1897. 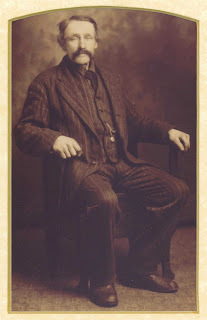 Robert Foster would stay in the Hintonburg area briefly as well, becoming assessor and tax collector of Nepean Township for several years in the 1890s, before relocating to the City View suburb. By April of 1893, the property was leased to Wilhelmina Sparks (1851-1923), daughter of Roderick Stewart, and widow of Robert Sparks (well-respected provincial land surveyor, who had died in 1882 in the sinking of the ship 'Asia' in Georgian Bay). 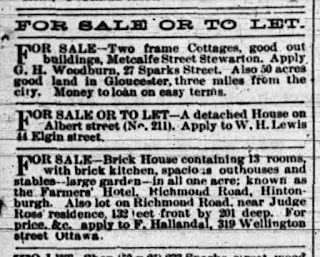 Wilhelmina had been living on the long-time Stewart family farm to the west (now the Wellington Village neighbourhood), but her brother Alex sold the entire farm to the Ottawa Land Association syndicate in 1893, so she had to relocate. from Nepean Township in December 1893. Wilhelmina Sparks and her three young children continued to operate the grocery store for about two years, until she moved into her family's stone house on Wellington at Julian, the home in which she was born, until her death in 1923. On May 4, 1895, an agreement was signed between Francis Foster and George J. Young to sell the old Hotel & grocery store for the price of $2,500. George James Young (1854-1932) was born in Chelsea, Quebec, and had come to the Hintonburg area at a young age. He had been in business in Hintonburg dating back to the early 1880s when he opened his original butcher shop at the south-east corner of Wellington and Sherbrooke. He and his wife Jane had four children (born between 1885 and 1905). On October 3, 1900, George J. Young took over as Hintonburg Postmaster, and the post office was relocated to the store, where it would remain for nearly 50 years. 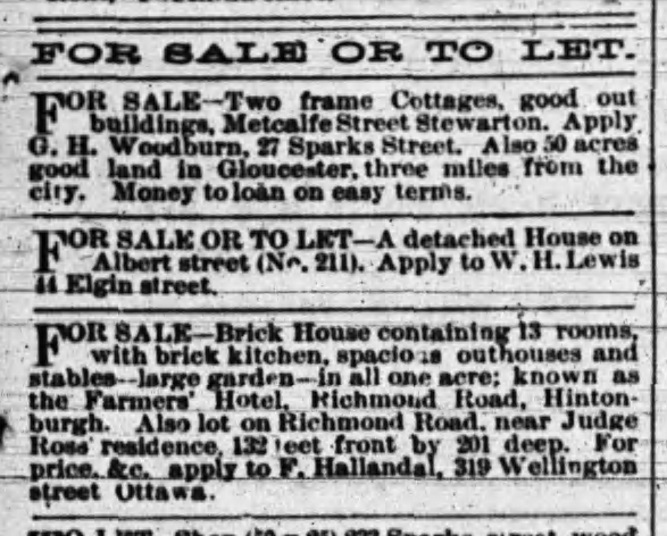 In this time period, Young also became quite interested in real estate investment, particularly in the Hintonburg area, and acquired several properties, constructing small, modest rental houses on many of them. He would mortgage heavily against the property, borrowing as much as $6,500 against it by 1917 (interestingly, his chief source of mortgage funds was not a bank or lending institution, but wealthy Ottawa spinster Anna Pinhey, granddaughter of Hamnett Pinhey, founder of Pinhey's Point). On the 1901 Census, George Young reported an annual income of $500 from the store, plus $96 of other earnings. The property was described as featuring a brick dwelling with 10 rooms, comprised of 1 store/warehouse, plus 3 barns/stables/outbuildings, as well as 4 small wood-frame houses (constructed at the south end of the property) rented to tenants. Around this point in time, an addition was put on the front of the store, to bring it right to the sidewalk at Wellington. This addition is very clearly shown in the 1980 photo at the bottom of this article. 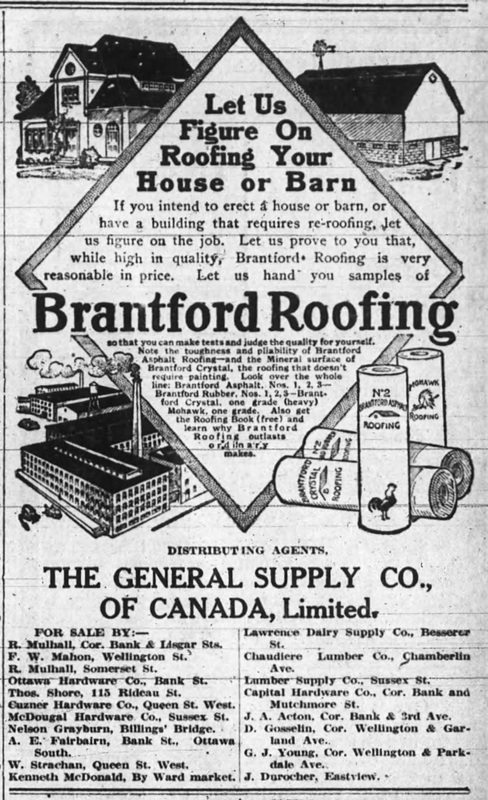 store of the era - roofing materials! quite built up, and the Youngs owned almost all of it. store portion of the building. 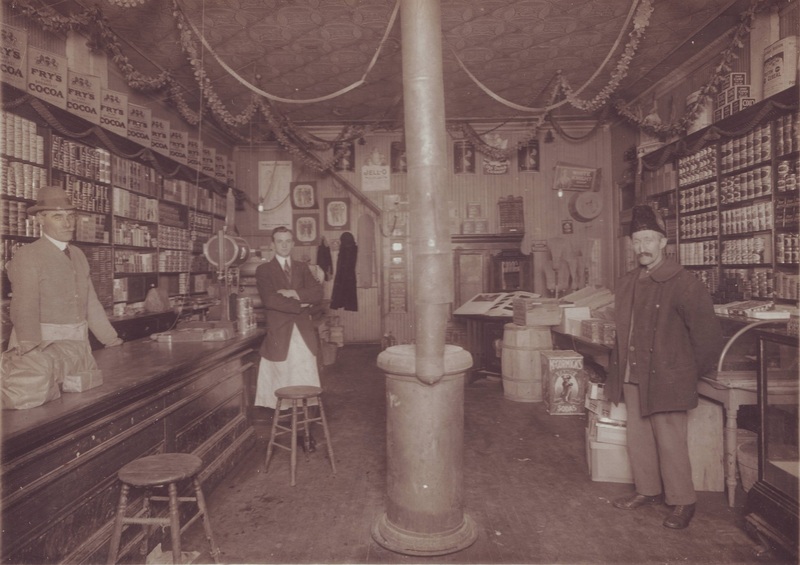 George Young ran the store and post office until early 1913, at which point he decided to retire. He resigned his post as Postmaster on February 27, 1913, at the age of 58. Young would maintain ownership of the property, but found a tenant to take over the store. In fact the property would remain in the family for nearly another 70 years. I spoke recently with Kenneth H. Young, grandson of George and Jane Young. He unfortunately did not have any photos of the building in its heyday, but had a lot of memories of the store and property, particularly as his father Kenneth Sr., had ownership of the property for many years (including operating a real estate and insurance business next door to the old hotel), and later Kenneth Jr. himself took over interests. He confirmed that he had known that the building had been an old hotel in the early days. Though he has no photo of the building, he did reveal that he kept a brick from it from when it was torn down. He also had kept for many years the original "Hintonburg Post Office" stamp, but had misplaced it over the years unfortunately. He also noted that his grandparents were very much involved as key contributors to Parkdale United Church in its early days. More from Mr. Young to follow below. In March of 1913, the grocery store and post office was taken over by Cherry & Craig Grocers. George Young divided the interior of the building even further at this point, creating a separate apartment unit overtop of the grocery store. The original hotel portion was now fully segmented from the store and new apartment. The Youngs continued to reside in the large hotel portion, known as 1182 Wellington Street, while the Craig family resided in the new apartment, given the civic address 401 Parkdale Avenue. 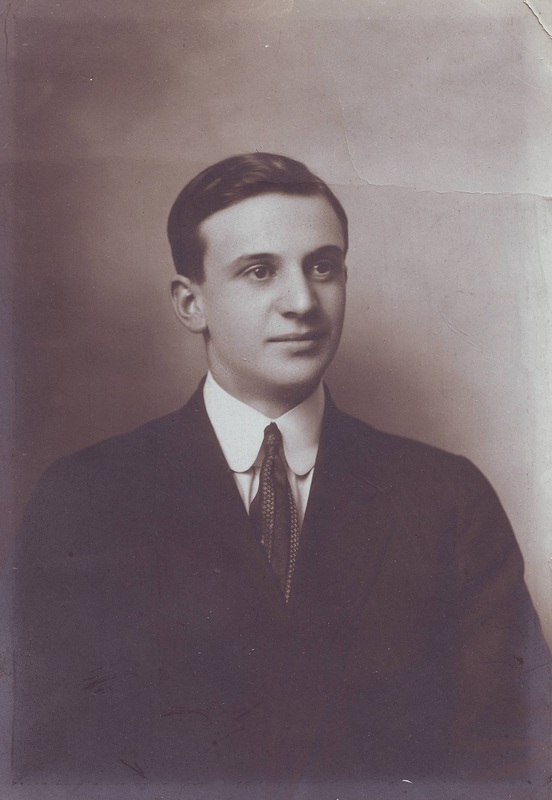 Russell Benson Cherry was born in 1892, making him just 20 years old when he co-opened the store with Jonathan H. Craig in 1913. 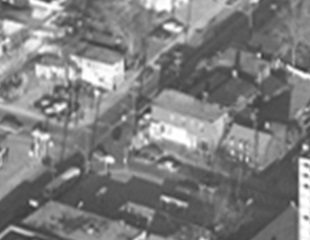 Craig lived above the store at 401 Parkdale Avenue, while Cherry lived on Grant Street with his parents. Cherry was appointed Hintonburg Postmaster as of March 27, 1913, a post he held until 1949 (except for a six-month period in 1916). several photos from the family album). 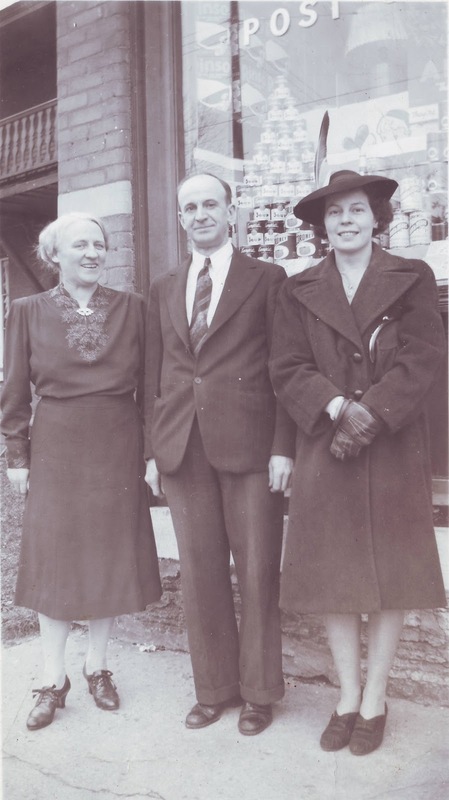 In February of 1916, Cherry stepped down as Postmaster and the grocery store itself was back in operation under the management of George Young. I have no idea why this would have been, but in September, Cherry retook the reigns, this time operating the store by himself, without Craig. Russell Cherry married his wife Bertha a month later in October, and they had their only child, son Donald Russell in May of 1921. Below is an incredible photograph of the Cherry grocery store and post office, taken somewhere around 1920. This is a view into the room that would have been the old Farmers' Hotel tavern from about 1882-1886, then the Foster's grocery store, and Young's grocery store. What a great photo from nearly 100 years ago. So much detail! tavern portion of the Farmers' Hotel, added in 1882. Here is the earliest photograph I was able to find of the exterior of the building, from an aerial photo from 1922. It's not great, but it's something. That's Wellington running left to right, with Parkdale running top to bottom along the right side. At the top left is the then-new Grace Hospital. Here is a photo of the R.B. Cherry delivery truck parked alongside the store on Parkdale Avenue. I approximate it to be from about 1930-1931. Cherry's Grocery store delivery truck. Circa 1930. George J. Young died August 19, 1932, and his widow Jane continued to reside in the residential part of the building until 1935 (she moved with family until her death in 1942). It was then left vacant for part of the year, as the family converted the building into apartments. There were 3 apartment units at first, which became 6 in 1938, and finally 8 in 1947. The longest-residing tenants were William R. and Alice Helmer, who resided in the building from 1939 until 1956. Young owned the growing block of buildings to the east, at 1172, 1174, 1176 and 1178 Wellington Street as well, including 1174 where Kenneth Young opened his insurance and real estate business in 1931 and operated into the 1970s. The photo below shows the store/building in the background. This would be someone standing on the northwest corner looking southeast. 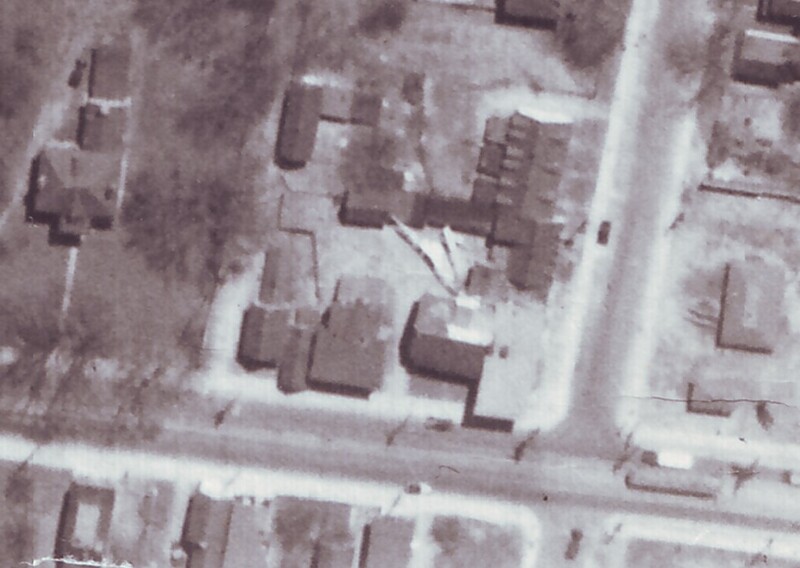 The store portion of the building is visible, as well as the duplex next door at 1176-1178 Wellington, and just at the left edge would be Kenneth Young's insurance office. The photo below is the only one which shows any level of detail of the front of the old store. You can see the word "Post" on the window, and a display of canned goods. Russell Cherry had occupied the store at this point for over 30 years. the grocery store & post office. I was fortunate to meet Mrs. Harriet Cherry recently, daughter-in-law of Russell and Bertha Cherry, who not only provided me these wonderful photographs, but also had a few great memories of the store. She could remember being in the store, but not because she had married into the family (by the time she married her husband Dr. Donald Cherry in 1952, the Cherrys had left the business), but because she had grown up nearby on Parkdale Avenue. I commented that her husband Donald must have worked in the store growing up, but she noted that he hadn't been too interested in that, and had "done everything else but that". She recalled that Russell Cherry had come from Stittsville, where his family had a store there, and that was likely why he got into the business in Hintonburg. Mrs. Cherry noted that Russell's wife Bertha worked full-time in the store as well, and her lasting memory of her from seventy-odd years ago, was her uncanny knack of knowing where everything was. "There was a whole lot of stuff all over the place, and if someone came in the store and asked for something, she knew exactly where to get it. It was amazing". She remembered Russell Cherry as a very good and kind man, who was also very charitable and generous, and always did little extra things for his customers. Often customers would have accounts in arrears, particularly during the depression and war years, and many debts were forgiven. Orders were phoned in to the store and delivered by Russell in his truck. She called it "a way of life that is long gone", and sadly so. The residential part of the building (the original hotel portion) fell victim to a significant fire in December of 1947, at noon on a Saturday. 27 residents were left homeless when fire ripped through the third floor of the house. Two infants, siblings aged 9 days and 14 months, narrowly escaped suffocation. While only the one apartment where the fire originated was damaged by fire, the other units were flooded. The fire was caused by an electric grill which had been left turned on for nearly four hours. yellow indicates wood, and blue is concrete block or stone. 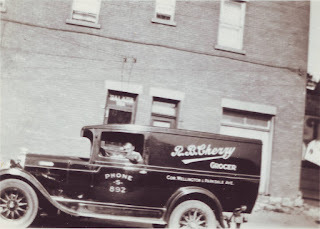 Meanwhile, the Cherrys continued to operate the Hintonburg Post Office until it closed on December 27, 1949. Post office operations were moved to the West End Postal Depot at 1309 Wellington briefly, before the new post office opened at Carver's Drug Store at 1314 Wellington in 1952. 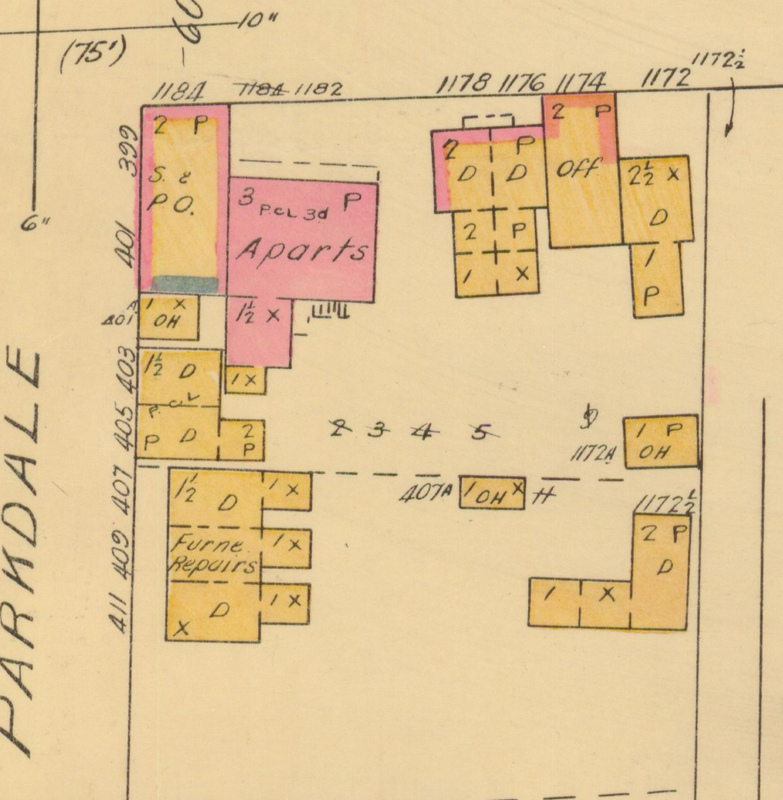 Of course a few years later the main postal depot was opened just behind the building on Parkdale Avenue, which still exists today. I asked Mrs. Cherry why the Cherry's closed the business in 1949, and she said that they simply had gotten tired. After nearly 37 years in business, working six days a week from dawn until dusk, the Cherry's earned a well-deserved retirement. The Cherrys had always been well involved with Parkdale Church over the years, and became even more so dedicated during their retirement years. Russell Cherry passed away in 1964, and Bertha in 1968. The store remained vacant into mid-1950, until a new type of store opened for business. The small grocery-general store was becoming a thing of the past as chain grocery stores began to spring up. Thus the new occupant of the shop became Malham's Smoke Shop. They would become yet another long-time tenant of the building, the final occupant, operating their store until 1980. 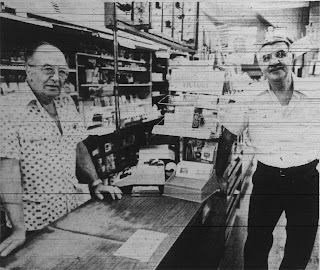 They were open from 7 a.m. to 9 p.m. seven days a week for nearly 30 years, selling mostly tobacco products, cigars, newspapers and magazines. The Malham name was attached to confectionery stores in Ottawa for practically the entirety of the 20th century. Abraham, Isaac and Jacob Malham came to Canada from Syria at the end of the 19th century (the 1921 Census puts the date at 1895, and the first evidence of the brothers arriving in Ottawa is the 1901 City Directory). By 1902, Abraham (1873-1936) had opened a fruit store at 209 Rideau Street, and soon after a confectionery at 272 Dalhousie Street, which was the start of a life-long career. Isaac as well would operate shops in Ottawa for his career, while Jacob relocated to Georgia in the States at a young age. Abraham would later be best known for his shop at 845 Bank Street, Palace Sweets. He had two sons Caesar and Nicholas (a third died in childhood), born in 1911 and 1912 respectively, and they too got into the business as youths. 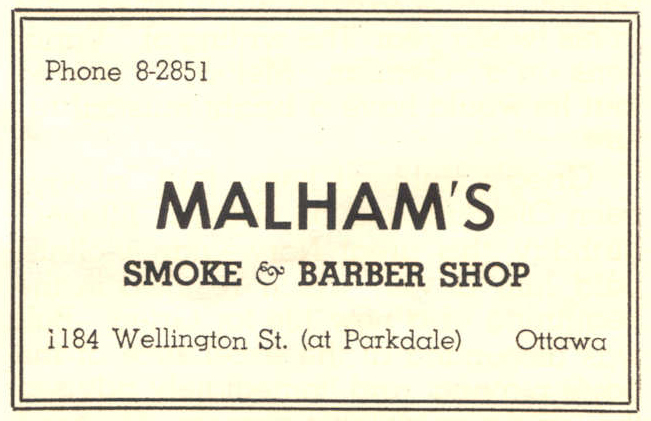 It was Nicholas who first opened the Malham's Smoke Shop at Wellington and Parkdale in 1950, while his brother Caesar carried on the business at Palace Sweets on Bank. However within a couple of years, Nicholas left the corner store business and became a life insurance underwriter. Palace Sweets was closed after 30 years, and Caesar moved over to Malham's on Wellington Street, where he remained for over 20 years. A barber shop was also a key component of the store in the 1950s. For most of this period, it was run by a gentleman named Harry Davis. Kenneth Young recalled that local celebrity Paul Anka was closely linked to the Malham family, potentially as a relative, and spent much of his childhood hanging around the store. 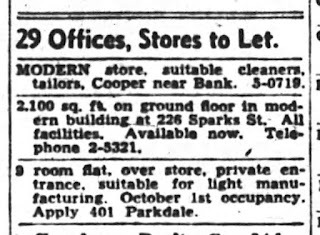 Meanwhile, the former residence above the store was converted in to office space (401 Parkdale) and housed various businesses such as Roy Bros. Upholstering and Whiteway Tailors. apartment above Malham's Smoke Shop. Here is an interesting view of the entire original hotel and building, taken from the rear of the building, during construction of the post office building on Parkdale in 1956. What sticks out is the sheer number of little add-ons and additions that have been added over the years! There are residential units tacked on everywhere possible! Below is the 1956 fire plan, showing a few less buildings, as some of the most run down had been demolished and removed, to make room for the post office. The plan notes that "Excavation" has taken place for the new post office building. Here are two different oblique views of the Parkdale-Wellington intersection from December of 1965. The first shot is looking east from the west, while the second shot is looking south from the north. There is very little that still looks the same at this intersection. Here is a view from the street-level of the store and apartment building, taken from the parking lot across the street (now the site of the large Hintonburg Place apartment building). It seems likely that this is not the original brick exterior to the old Farmers' Hotel. 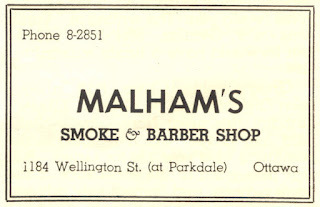 July 30th, 1980, was the last day of business for Malham's Smoke shop at Wellington and Parkdale. Its closure was reported in the Citizen under the headline "Era ends with closure of corner smoke shop", which described the store as "renowned for its enormous selection of newspapers, magazines, and imported tobacco." 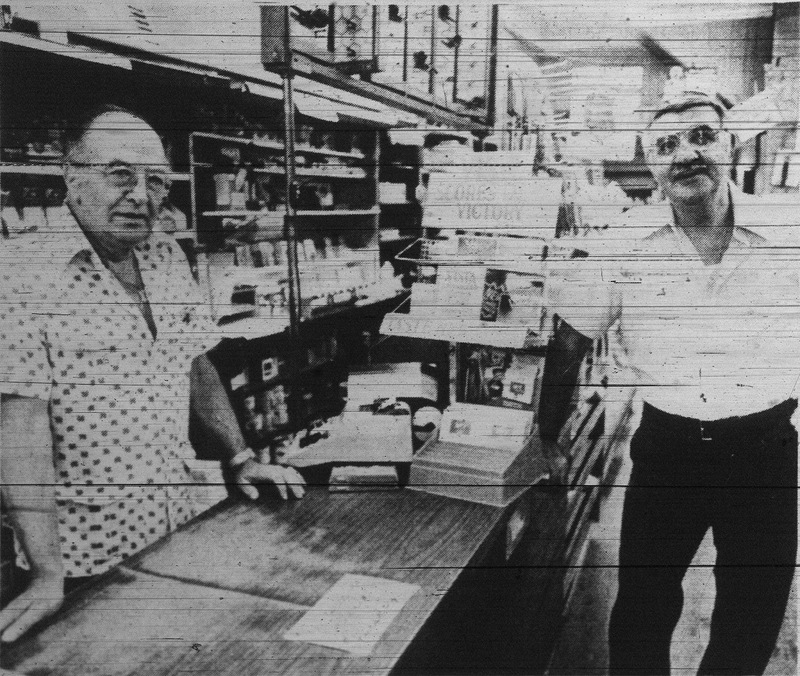 Caesar Malham had retired in 1976, and the store continued on by Bob Ellis, Malham's brother-in-law who had become partners in the business with Caesar in 1964.
very back of the store, identical to how it looked in 1920. On August 1st of 1980, Bob Ellis re-opened Malham's further west up Wellington on the main floor of another Hintonburg landmark, the Iona Mansions at 1131 Wellington Street which operated into the early 2000s. Ellis retained the name, as he said "Malham's Smoke Shop is an institution." Meanwhile, Caesar Malham passed away on Christmas Day, 1999 at age 88. In 1951 Kenneth Young Sr. (son of George and Jane Young) had become owner of most of the block. He maintained ownership until his death on August 10, 1976. The property remained part of his estate, managed by his son Kenneth Young Jr. until August 6, 1980, when the lot was sold to the Governing Council of the Salvation Army for $185,000. The Salvation Army used the lot as expanded parking space for the Grace Hospital, which is what it continues to be used for today. Kenneth Young explained that he'd had plans for the property. The building itself had deteriorated significantly, and was on the cusp of being condemned by the City. He had submitted plans to the City of Ottawa building department for a new build on the lot, but the delays and red tape frustrated him. His mother had been very fond of the Salvation Army and their work, and so it was decided to simply sell the property to them. The building was demolished in segments. Mr. Young mentioned that the work was done by Cohen's. By luck, a photograph of the building in its final days existed in the City of Ottawa Archives. The photo was taken on April 2nd, 1980, and shows what I believe to be the western brick wall of the original Farmers' Hotel building from 1866. The portion behind this wall is the 1882 addition, and then you can see other additions made over time at the front and back, encasing that 1882 addition. I'm sure by 1980, from the interior of the building one would not have suspected that an old 1860s hotel was contained within. So there it is, the story of the legendary Farmers' Hotel that was a big part of the early days of Hintonburgs development, and the post office and corner store that was a central spot for the community for the following almost-100 years. This was not an easy topic to research, and the photos and details were about as hard to come by as I've found on any topic I've done, but the story is such an important one, and I'm happy to be able to bring it to life here, 150 years later. Young and Cherry corner stores, and Malham's Smoke Shop.